Northern Ireland – Returning to sectarian conflict? THE AFTERMATH of the recent killings of two soldiers at Massereene barracks in Antrim and of a PSNI officer in Lurgan in March has demonstrated the fragility of the peace process. In recent years, the various dissident republican groups have made many attempts at killing a PSNI officer. Even with high levels of State infiltration, it was only a matter of time before one of the dissident groups succeeded. The original aim of killing a PSNI officer was to undermine attempts by Sinn Fein to encourage Catholics to join the PSNI. Hence, most of the early attacks were on Catholics who had joined the police. But the strategy of the dissidents has broadened further than just attempting to intimidate Catholics and stop them from supporting the police. The recent killings are not the beginning of a new “armed struggle” aimed against the State or British imperialism. If the IRA, which had a certain base of support in Catholic areas, could not defeat the State, the dissidents have no chance. Their real aim is to provoke repression from the State to lay the basis for a renewed conflict and to provoke a sectarian backlash. The nature of the riots which broke out at “interface” areas after the charging of Colin Duffy (until recently a leading Eirigi activist) also illustrates the sectarian character of the dissidents. NIE, postal workers and water service workers were also attacked and their vans hijacked. The shooting of the two pizza delivery workers in Antrim – so-called “legitimate targets” – also sums up the dissidents reactionary attitudes towards workers. The attempt to provoke repression is based on the effects State repression caused in the past. Bloody Sunday and the introduction of internment in the early years of the Troubles acted as very effective recruitment tools for the IRA at the time. 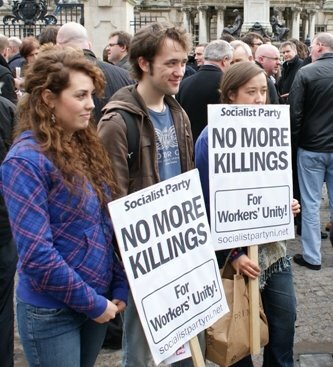 Seeing no alternative road to struggle from the leadership of working class organisations such as the Northern Ireland Labour Party or the trade unions, an entire generation of radical Catholic youth were lost to the false and counter-productive ideas and methods of individual terrorism. However, the ruling class and the State have also learned lessons from these experiences and have consciously avoided implementing widescale repressive measures which could push Catholics into the arms of the dissidents. Yet there has been an increase in repression on a smaller scale. The sight of police officers aiming machine guns at homes in Lurgan, raids being carried out in housing estates, and the return of checkpoints in areas such as West Belfast will further alienate Catholics, in particular young people, from the State. The decision of Martin McGuinness to stand shoulder to shoulder with PSNI Chief Constable Hugh Orde and First Minster Peter Robinson, and denounce dissident republicans as “traitors” to Ireland. Sinn Fein did this in order to satisfy Protestants and the unionist parties and to cut across any instability. Paradoxically, the shock and opposition to the killings actually had the effect of temporarily strengthening the power-sharing institutions. It enabled the main parties and the establishment media to argue that the way to isolate the dissidents was to rally behind the peace process and the parties in power in Stormont. The media played a conscious role in using the killings to downplay the disaffection which exists in working class communities, Catholic and Protestant, against the political parties in Stormont. The rallies organised by the Irish Congress of Trade Unions, which attracted the support of the majority of working class people were also used as an opportunity to argue that the choice working class people have – is between the Assembly parties or the dissidents and a return to sectarian conflict. This was summed up in ICTU President Patricia McKeown’s speech outside Belfast City Hall which urged people to stand united with the sectarian parties in the Assembly; the same parties who are attacking public services and workers jobs and conditions! There is a real danger the leadership of the trade unions will repeat the mistakes of the past and not provide a working class alternative which can unite Catholic and Protestant working class communities against the right-wing policies of the sectarian parties in Stormont. If a mass socialist alternative is not built in the coming period, then sectarian forces such as the republican dissidents and new loyalist formations in Protestant areas will grow by tapping into discontent with the ruling parties.